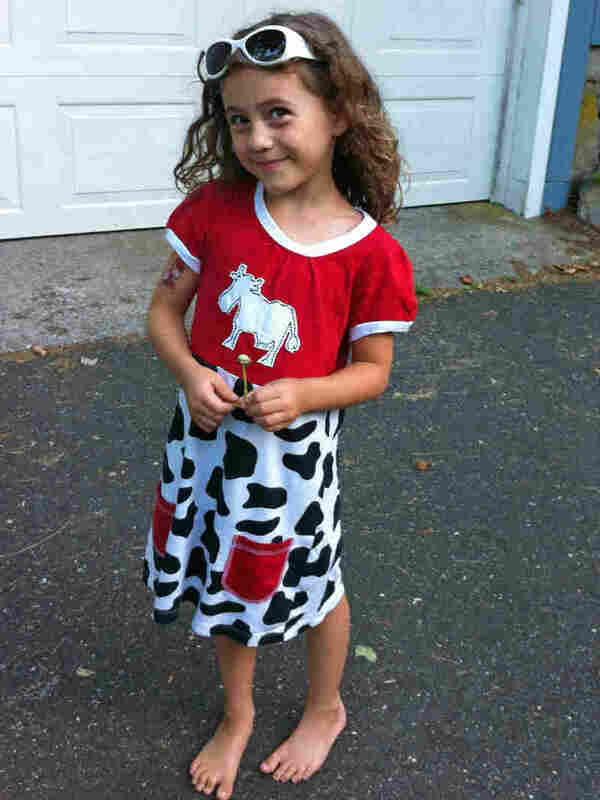 A Newtown Family's Campaign To Change How We Think About Violence Avielle Richman was 6 years old when she was killed in her first-grade classroom. Her parents think a possible solution to gun violence is to treat it like a disease. 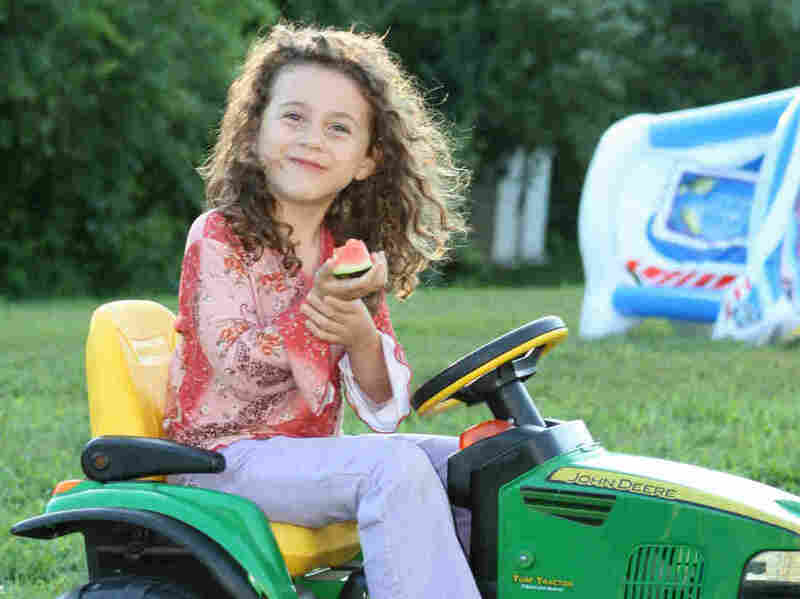 Five years ago, Avielle Richman, 6, was shot in her first-grade classroom at Sandy Hook Elementary School in Newtown, Conn. But as painful as Dec. 14 always is for them, Richman and Hensel say the roller coaster ride leading up to it can feel even worse. They celebrate their 3-year-old daughter Imogen's birthday in October. Baby Owen's birthday is in November. And right in between is the day they should be celebrating Avielle's. "There's really no way to appropriately recognize your lost child's birthday," sighs Richman. This year, he and Hensel have invited a small group of friends to join them on the day Avielle would have turned 11, including Francine and David Wheeler, whose son Benjamin was also killed at Sandy Hook. Also around the table are the Wheelers' 14-year-old son Nate, who survived the shooting from just a few doors away, and their 3-year-old son Matty. They're feeling their way as they go. Richman puts out a plate of 11 cupcakes with a birthday candle in each one. Six candles are lit. Five are not. Hensel says singing "Happy Birthday" doesn't feel right to her, so they decide to just say it aloud together. On the count of three, the group says in unison, "Happy 11th birthday, Avielle," and Imogen and Matty blow out the candles. The little kids dive in, frosting first, and chatter about how yummy the cupcakes are. Then Imogen suddenly stops talking and asks her mom to bring over the framed picture of Avielle from the fireplace mantel in the next room. Hensel points out Avielle's long, curly hair and smiles at Imogen. "She's a curly girly just like you!" she says. Imogen wants to show off the photograph. "Look, Matty!" she says. "Avielle died?" Matty asks, though it's hardly the first time he's heard about Avielle or his brother, Ben. These are what Richman calls the "tricky" conversations, which these kids have been forced to have at way too young an age. As the Richman family marks what would have been Avielle's birthday over cupcakes, 3-year-old Imogen shows Matty Wheeler, also 3, a photo of her older sister. "Unfortunately...we have to navigate these tricky waters of 'you have an older sister but she's not with us anymore,' and that she was hurt, she was killed at school," Richman says. "That's a tough one to explain." It's hard to find the right balance, he says, between being honest, and still making her feel safe and secure. "We don't want to stoke fears that are so unlikely that you shouldn't have to worry about it," he says. "But how do you say, 'There's no risk, don't be afraid, we'll protect you'?" Especially when horrific mass killings keep happening. In October, when news was breaking about the 59 people killed at a concert in Las Vegas, Richman first knew something terrible had happened when friends started texting "thinking of you" and "sending hugs." It's the same way he found out about the shootings in Orlando, and Charleston, and so many other places. Richman says for the first few years after Newtown, he and Hensel were devastated every time they heard about another mass shooting. "We would just bawl. It would just hit us so hard," he says. "But now I get angry." Like many Americans, they believed the murders of 20 children would finally be a turning point for the nation. "When will it be enough?" he says with exasperation. "I feel like we're letting it happen. That there are things that could be done, that aren't being done." 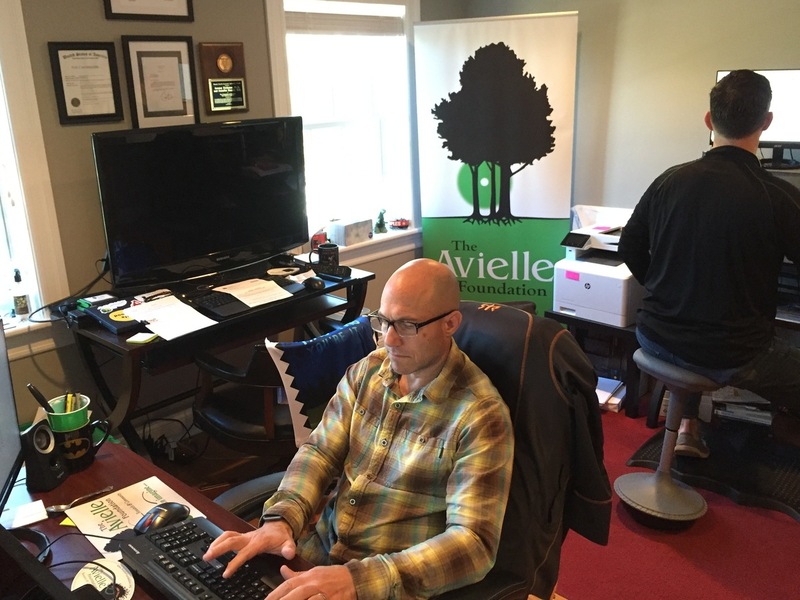 For nearly five years, Jeremy Richman and Jennifer Hensel have poured themselves into The Avielle Foundation, which they founded to combat what he calls a public health epidemic of violence. But also, true to his training as a neuroscientist, Richman believes that the way to stop abnormal behavior is to better understand abnormalities in the brain. He sees gun violence as "a public health epidemic." For five years now, he and Hensel have poured themselves into The Avielle Foundation, which they founded shortly after Avielle's death to support research into the neurological underpinnings of violence, and to promote what they call "brain health." The morning after the Las Vegas shooting, Richman addresses a group of nurses in New York, making the case he has made countless times in the past five years: Most mass shooters, including the 20-year-old man who killed his daughter, are afflicted by an illness of the brain. "It's just another organ that can be healthy or unhealthy, just like heart disease, or cancer or diabetes," he tells the crowd. "We need to recognize that [the aberrant violent behavior is caused by the brain's] chemistry and structure, not character flaws. "We need to be able to offer diagnoses, like 'Your child has too much dopamine in his right cingulate cortex,' which is a fancy-pants way of saying, 'This totally explains his impulse control problems.' We need to build bridges between the biochemical sciences and the behavioral sciences." Richman is the first to concede the science isn't there yet. But his dream isn't just a pie-in-the-sky fantasy. Just like resources were poured into landing a man on the moon and exploring outer space, Richman says, "We need to invest in exploring our inner space." The foundation's tag line is "You can imagine." It's a play on the condolence litany Hensel and Richman heard so often after Avielle was killed; people would shake their heads and say, "I can't imagine what you're going through," or "I can't imagine how hard it would be to lose my child." "You have to imagine it," Richman implores the crowd. "When you allow yourself to imagine such tragedies, you'll be motivated to take action." That's exactly why he keeps telling his story and is so deliberate in the detail. In his speech to the nurses he describes an ache so crushing, he felt like if he didn't lie on the floor, he'd "get spun right off the planet." And when he mentions the 26 people killed in Newtown, he describes their "innocent lives snuffed out, violently and viciously." "I want people to hear the reality of it," Richman says. "I want people to know that they were brutally blown apart with a large gun. You know, I want people to imagine it." "It takes a lot out of you emotionally and physically," he says. "But when I feel like somebody has heard our message, and maybe I saw that little flicker of 'oh!' or that one head nod, that makes my day and totally bolsters me." Richman and Hensel are also shored up by the joys of parenting Imogen and Owen. They were the only Sandy Hook parents to have lost their only child in the shooting, and it left them with an excruciating emptiness. "It was like a ghost limb syndrome, you know, where you keep thinking 'Where's Avielle? Do we need to pick her up?'" Richman recalls. "And every day you'd have this [realization] that I don't have a child, and I don't have to parent. That was just brutal." It did, however, afford them a little more space to grieve. "It's two sides of a coin that's brutal on either flip," says Hensel. Unlike other parents who had to muster the strength to take care of another child, she says, "I looked around and thought 'Oh my gosh, I get to be sad.'" 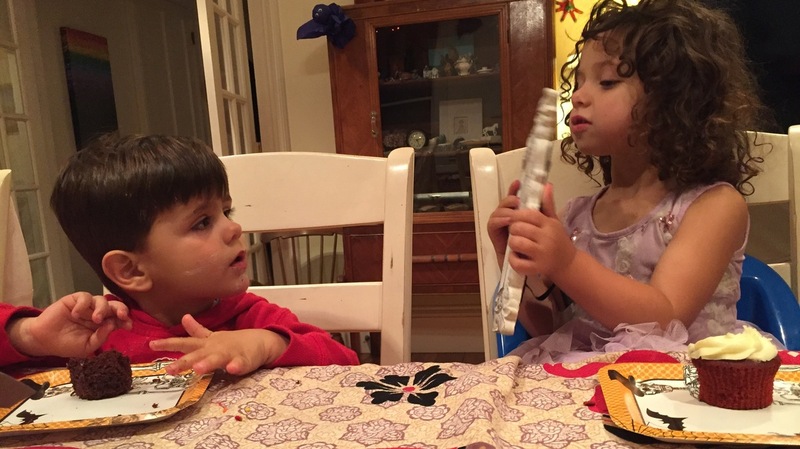 These days, their grieving process tends to give way to the daily demands of parenting. The morning after the Vegas shooting, they felt like crying or screaming. Instead, they turned off the news, put on some kids' music and started dancing. But they are ever mindful of what they call their "infinite pain." "You have to pay attention to that, or it'll sneak up on you," says Hensel. "It has to be tended to. It's painful, but it reminds me of how much I love my daughter." Those memories can make for a minefield of emotion. Smiling in her car seat on the way to school, Imogen looks just like Avielle did when she was 3, and she shares many of the same interests and habits — including a penchant for naming everything and anything around her. "His car's named Hob Gob," she announces, matter-of-factly. "Yup," Richman confirms. "My car is named Hob Gob." As they arrive at Imogen's school, about as far across town as possible from the school where Avielle was killed, Richman waves goodbye. "Love you baby," he calls out, as Imogen bounces away. "It's really hard to drop her off at a school," he says. "That thought is always in your head. Five years out, and it's still always there. It's just that maybe, you learn to function with it." Indeed, Richman will be the first to tell you that his work at The Avielle Foundation is not only a means to an end, but also an end, in and of itself. "You have a reason to get out of bed," he says. "You have to have a reason to push and change." The irony is not lost on Richman that The Avielle Foundation's office is housed inside a long-abandoned psychiatric hospital. He has made it his full-time job to press for what he calls "the huge paradigm shift," to view violence as a disease. It's key to his goal of "understanding the pathways, pathologies and risk factors leading to violence, and the protective factors that can protect against violence and bolster compassion." But Richman is quick to add: explaining violence is not the same thing as excusing it. "Just like you're responsible for your cardiovascular health, if you're fighting against hypertension or diabetes," he says. "It's not easy, but it doesn't mean that it's out of your control, that you're just good or evil. You're still responsible for maintaining your health. And the same goes for this organ, the brain." So far, the foundation has helped fund three studies, including one promising look at identical twins, suggesting some neurological differences that may be associated with aggressive anti-social behavior. The initial findings were so compelling that the pilot study has since been awarded nearly $7 million in federal grants to continue their work. The foundation's fundraiser, Nick Hoffman, recalls his goosebumps when he heard the news, inching them closer to answers. "You know it's not an 'if,' but a 'when' we will do this," Hoffman says. So far, donations — ranging from bags of change earned by lemonade stands to major institutional gifts — total around $1.25 million for research and community education, like the public speaking engagements that have reached some 15,000 people and a new brain health first-aid course the foundation developed that's being piloted in Newtown schools. "That vision that Jer and Jenn had — just days after the loss of Avi — they've brought it to life, Hoffman says. "We're doing it, and we can do more." The foundation office's walls are covered with signs of progress and encouragement. There's an award from Yale University for mental health research advocacy, and a letter from President Barack Obama thanking them for their work to "end the heartbreak caused by gun violence." There are also photos of fundraiser road races, and new pictures waiting to be hung of Richman meeting last month with the Dalai Lama, as a delegate of the U.S. Institute of Peace's Youth Leaders Exchange. And of course, there are pictures of Avielle. Hensel says she used to be so annoyed with Richman's constantly snapping photos, they used to call him "Papa-razzi." "But after the tragedy," she says, "I just hugged him so hard and said 'Thank God! Because we have so many pictures now that we never would have had. That history would be gone.'" "We're just getting farther out from Avielle, and it's heart-wrenching when you can't remember something," Richman says. "Jen and I have both expressed this panic [that] I can't hear her voice in my head, and it hurts. And you know that's just going to get more and more profound with time." After the cupcakes for what would have been Avielle's 11th birthday, Richman and Hensel bid goodbye to their friends with a group hug. They slowly clean up and put away the cupcakes, while still savoring Avielle's sweet spirit. "I think she's everywhere," says Richman. "She's in the air we breathe, she's in my mind always, and she's my heart, she's in our children and our spirits. She's everywhere, but nowhere that I can squeeze and hold." Instead, Richman and Hensel hold fast to Avielle's memory, while they keep grasping for a better understanding of the sick behavior that took her life.